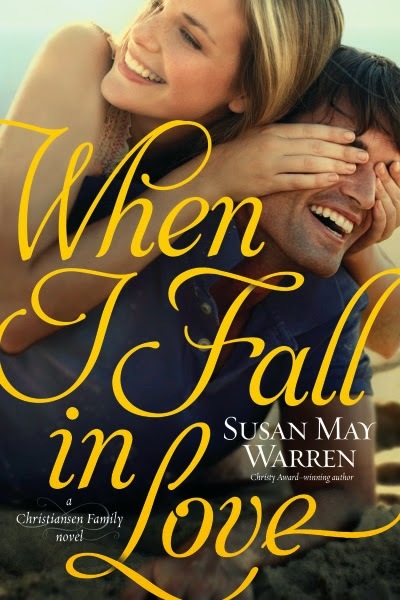 The third novel in the Christiansen Family Collection, When I Fall in Love by Susan May Warren, is one I purchased and then asked to review. I didn't mean to double up! But I like Susan May Warren's work, especially her Deep Haven books. This one was certainly worth paying for. The series is about the Christiansen family -- a group of six grown children -- with each novel focusing primarily on one of the siblings. Grace, the middle daughter, is at the center of this one. I found myself really liking Grace. I think this may be my favorite Susan May Warren novel yet. Part of it, I am sure, has to do with having read most of her works now, and this novel had so many of her previous characters included in various scenes. The older Christiansen siblings, of course, who both get married in this novel. But there are also appearances by characters of other Deep Haven books. A main theme in this novel has to do with dealing with fear. Grace is clearly afraid of stepping out of her comfortable life, but her siblings practically force her to at least do a little. Max is afraid to love anyone, knowing he has a genetic disease that will almost certainly cut his life short. How do you trust God outside of what seems comfortable and safe? This novel has believable characters, who tend to be in fairly extreme situations. Locations "feel" real, as do the interactions between characters. It is so easy to end up completely immersed in the Deep Haven world.